Guardian allows for compression to be added on a per neighbor basis. You may wish to compress a certain neighbor connection due to bandwidth availability. For example, for a neighbor circuit with a low capacity, you can reduce bandwidth consumption by incorporating compression. Unlike the Enable Compression feature available via the Daemon Setup window, whereby you configure compression for a Remote Daemon connection, the compression option via the TTM Wan Router Setup window is used to configure compression between two WAN Routers. 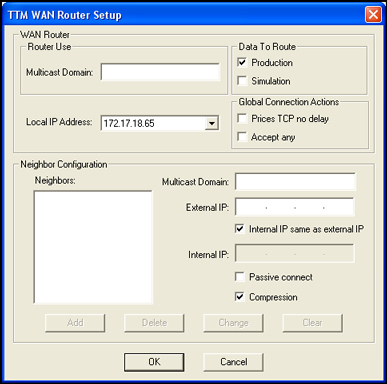 On the WAN Routing menu, click Wan Router Setup. The TTM WAN Router Setup window displays. In the Neighbor Configuration section, click the checkbox next to Compression.